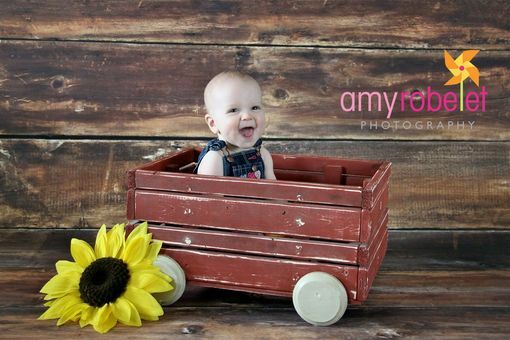 Imagine a Field full of sunflowers with this darling little wagon sitting right in the middle of it, could there be anything cuter than that!! Now you can grab that darling photo with this wonderful Rustic Wagon. This wagon is perfect for an on the go Toddler or a snuggly newborn. The possiblities are endless when it comes to what you can do with this wagon. This wagon comes in the Rustic Red but can be custom painted in any color you would like. Just send me a convo when you order with what color you would like. This wagon comes with a really cute pillow for those newborn shots. That way you can lay them ontop so they can lay on the top of the wagon. The wagon measures about 20 inches long by 14 inches wide and about 12 inches deep. The wheels on this wagon are for show only they do not move. All of my Pint Size Props come fully assembled, painted, and ready to use. Order yours today knowing you are going to get what you pay for and more! Just read my feedback from all my happy customers. Thank you so much to Amy at AmyRobelet Photography for the amazing Photo!! I love custom orders so If you have an image you want me to bring to life for you just send me a message. Please allow 10 days for this wagon to ship as they are custom made just for you!! I ship worldwide so email me for a quote if you are outside the USA.